Mediterranean countries are wonderful for catching glimpses of the past. Not only can you wander among extensive ancient ruins, but there are still elements of the past visible in daily life all around you. In the souks of Morocco you can still find coppersmiths, acrobats and pavement dentists, just as you could have done in Roman times. We know from primary sources that ancient Roman tourists also endured annoying beggars, pushy shopkeepers, unwanted guides, unscrupulous innkeepers and overpriced food, just like today's tourists. 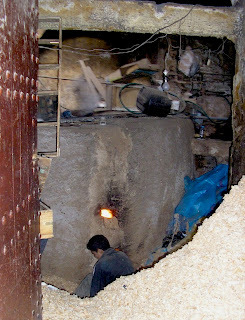 A door opened in the Fes souk, and I saw a boy shovelling sawdust into the furnace of a hammam the same way bath-slaves would have fed a Roman hypocaust. In Greece you can still see peasant women sharing donkey's backs with piles of firewood. You can sit at a table in the cool shade of an ancient plane tree sipping resinated wine from a copper beaker and eating olives, 'a taste as old as cold water', as Lawrence Durrell writes. In holy places, saints have taken over the duties of the gods. 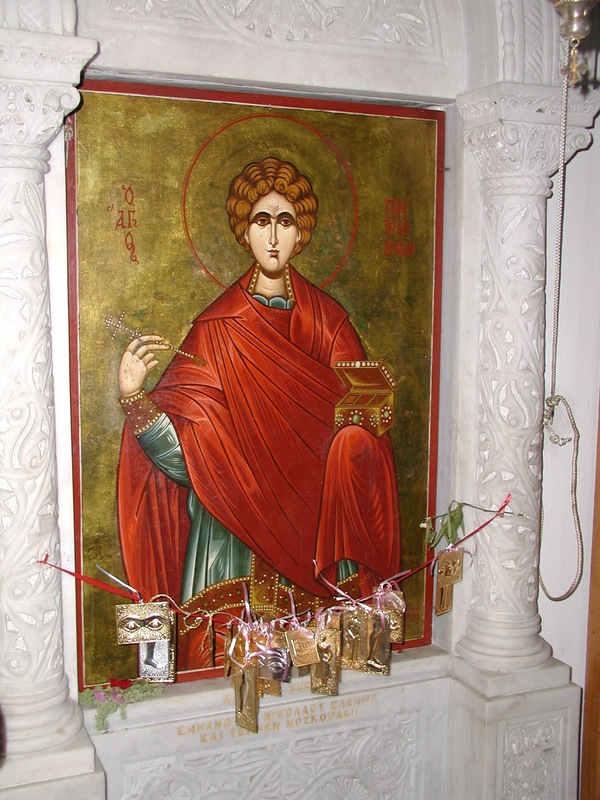 On the island of Kalymnos in a cave sacred to Panteleimon, a saint who heals, you can see votive plaques of tin or copper offered for the afflicted part of the body. Such votive offerings go right back to Greek and Roman times, when suppliants offered clay parts of the body to remind the healing god Asklepios which of their bits needed healing. On another part of Kalymnos, you can buy little nuggets of ivory coloured resin. This is mastiha, an ancient version of chewing gum, still recommended to freshen the breath and calm stomach upsets. 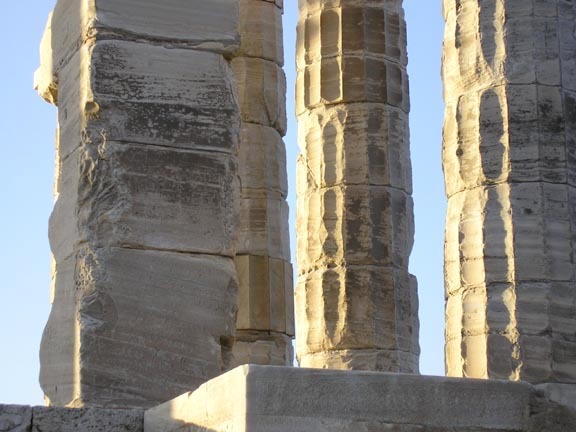 On the Greek mainland, the road from Corinth to Athens is virtually the same route Theseus took 3000 years ago. You can still see a stretch of road called the Evil Stairs (Kaka Skala). It was here that the robber Sciron forced travellers to wash his feet. Then he would kick them over the precipice to be eaten by his pet turtle. Our taxi driver knew they were called Evil Stairs but didn't know why. He had never even taken the coastal road, having always gone on the modern bypass. Along the coast road are many shrines. Some are dedicated to those who died on the road, but others are just shrines to Mary and Jesus. In most Mediterranean countries, taxi drivers and truckers still hang votive charms from their rearview mirrors. 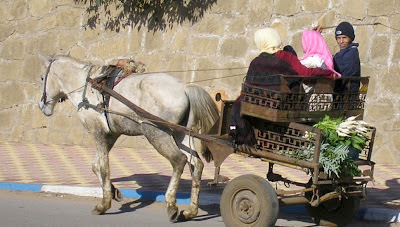 Roman cart drivers would have done the same thing. At the stern of every Roman ship was a small shrine to Venus, protector of sailors. In Italy the locals recruited to excavate Pompeii in the summer months rush to gather handfuls of wildflowers and weeds, the same medicinal herbs Pliny the Elder recommends in his Natural History. Or they might find the iron remains of an ancient Roman hoe which perfectly fits the wooden haft of their zappa at home. 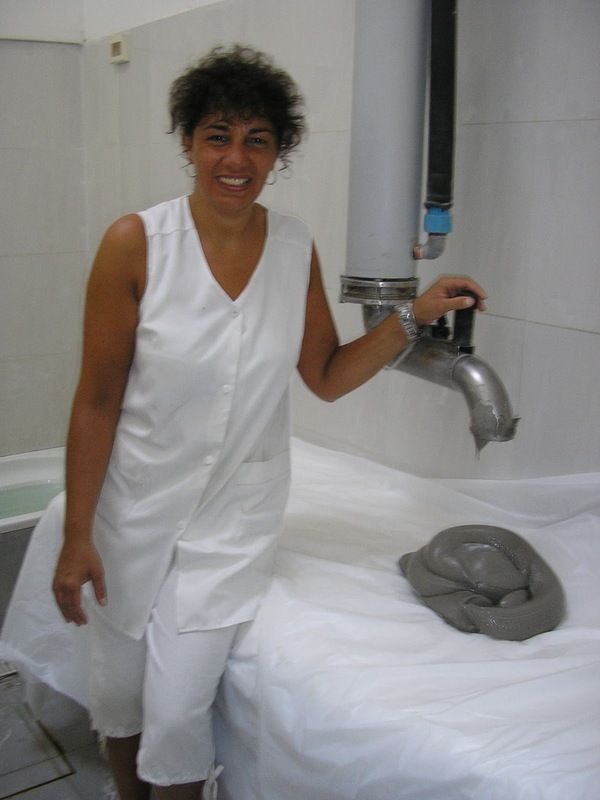 fango is Italian for "mud"
Today's spas and retreats go right back to the hot springs of Baiae and other Roman sites, where the rich would flock to cure their ills and indulge in orgies. On the island of Ischia in the Bay of Naples I took a 'fango bath' in glutinous black mud to the smell of suphur. Is this an experience Pliny the Elder might once have experienced? I'm sure it was! In 21st century Rome, after a day exploring Roman ruins, you can sit in the Piazza Navona (built on the site of a chariot racecourse) and watch the modern Romans promenade. It's not hard to tell which are descended from patricians, which from plebs and which from peasants. In ancient Rome, the patron had power and he looked after his clients. In return they did favours for him. The word padrone means godfather. I will not even mention the M-word. The first century poet Martial writes 'All Rome is at my bed-head.' Anyone who has spent a summer night in a Roman hotel room with no air-conditioning will sympathise. Through the open window, you can hear arguing spouses, amorous lovers, crying babies, barking dogs and loud music. A street sweeper sounds like he's right in the room with you. 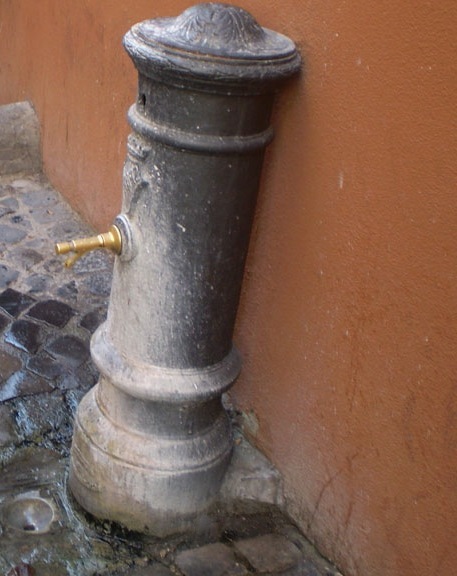 Other sounds that won't have changed in 2000 years include the spatter of a fountain as the water strikes the cobblestones, the piercing cries of swifts wheeling overhead, a distant bray of a donkey and the incessant shimmering cry of the cicadas in summer. Ancient Romans didn't go to the cinema to watch violent, bloody films. Instead they went to the Colosseum to watch the real thing. The closest modern equivalent are the bull fights still held in Spain. Just as in Roman times you would have an opening procession, musicians playing in the stands, touts selling cushions, drinks and nuts, the waving of handkerchiefs to show approval, the raking of bloody sand between bouts, and the movie-star status of popular gladiators or beast-fighters. These bullrings are mini replicas of the ancient Roman amphitheatres, sometimes even down to the garlands draped from awnings. Can you see Byron's graffiti? L.P. Hartley famously said 'The past is a foreign country', but I see it the other way round. 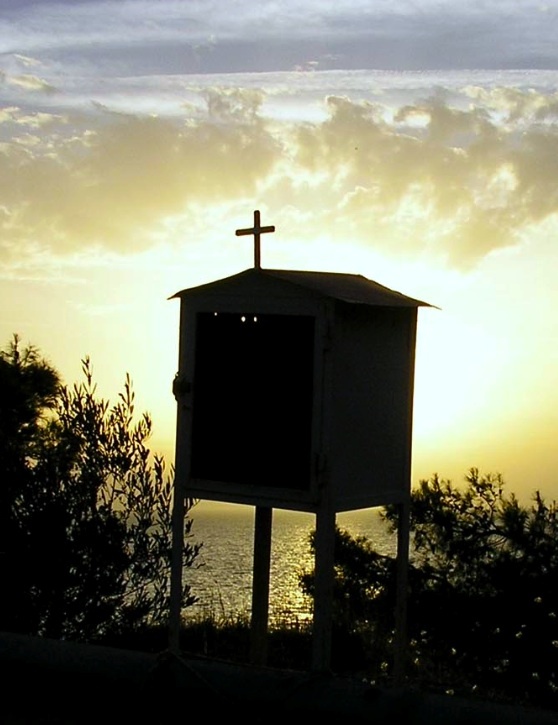 Every time I travel to another country – especially the Mediterranean – I go back to the past. Caroline Lawrence writes history-mystery books for kids (and secretly for grown-ups). 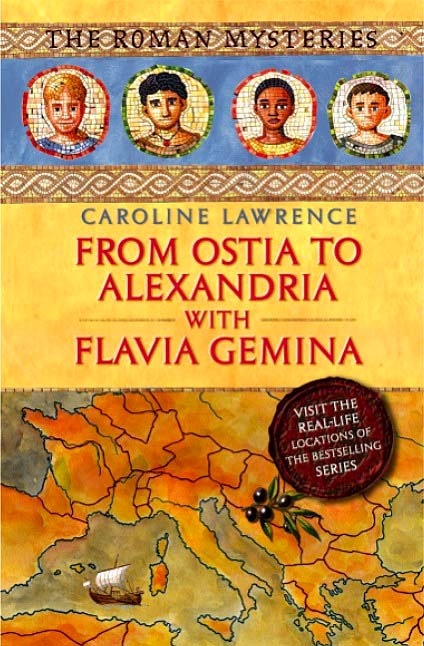 Her Mediterranean Travel Guide, From Ostia to Alexandria With Flavia Gemina, is now available on Kindle. It's an amazing experience. The further up you are the more remote it seems, which explains why women and children were allocated the highest level of the Colosseum! Nothing could possibly make me want to see a bullfight! (nor a bloody and violent film, come to that).